Anyone in the United States who has eaten strawberries, cranberries, cucumbers, or tomatoes has undoubtedly purchased produce grown in the San Quintín Valley, a rich agricultural region located on the northwest coast of the Mexican state of Baja California. San Quintín employs tens of thousands of field workers who have long been denied salary increases and various benefits, including some to which they are already legally entitled. In March 2015, their frustrations boiled over into a massive strike—a move driven in large part by the efforts and determination of female field workers. The protesters, who walked off the fields during peak harvest season, made a list of demands, including an increase in their daily wage to 200 pesos (about US$13), better access to healthcare benefits, and an end to the sexual harassment and abuse of female workers. They also blocked parts of the Transpeninsular Highway, the main roadway to export markets in the United States, crippling the state’s agricultural export economy. Police responded by shooting tear gas and rubber bullets at protesters; more than 200 were arrested and hundreds wounded. Images of the crackdown taken by cell phones quickly went viral. Three days later, the authorities agreed to give farmworkers the right to establish their own independent trade union, separate from existing unions affiliated with the country’s ruling party. However, strike leaders continued to push for more comprehensive reforms. On May 9, heavily armed state police stormed the homes of San Quintín field workers, dragged them outside, and demanded to be told the names of their strike leaders. Although the police claimed that they had fired rubber bullets during these altercations, YouTube videos uploaded by field workers revealed real bullet shell casings littering the dirt floors of their homes. Seventy people, including women and children, were wounded. Following often tense negotiations, the strikers secured an agreement on May 14 providing workers with wage increases of between $9.50 and $11.50 a day, guaranteeing overtime pay and social security benefits, granting legal recognition to a new independent trade union, and creating a fund for workers’ housing. The landmark deal, which was finalized on June 4, represents a milestone achievement in Mexico’s farm labor movement. However, the agreement is not a binding and legally enforceable contract, and questions remain as to whether the government will ensure that all of its provisions are actually enacted. During the last two decades, the San Quintín Valley has become one of the most important agricultural areas in the country. A majority of the region’s 70 farms are owned by 24 companies, most with close connections to government officials. The two largest firms are BerryMex, which supplies the American company Driscoll’s, and Los Pinos, whose owners have strong political ties with the National Action Party—the party of the governor of Baja California. In San Quintín, 62 percent of all women over the age of 12 work in the fields. Emilia became a strawberry picker when she was 12 years old, just like her mother. Now 28, married, and the mother of three children ages 11 years, 7 years, and 18 months, she currently works for BerryMex picking raspberries. She is not allowed to wear rubber gloves because the delicate fruit can be damaged by the material. Every night after work, Emilia removes painful raspberry bush thorns from her fingers using a needle she cleans with a candle flame. Her injuries sting when she washes the dishes or makes tortillas. “But that’s what Americans expect. They ask for quality, better quality, always the best quality, so we have to be careful with the fruit, so that it remains pretty, perfect, intact, picture perfect,” she explains. In addition to experiencing the same poor working conditions as their male counterparts, women field workers often face the additional threat of sexual harassment and violence on the job. 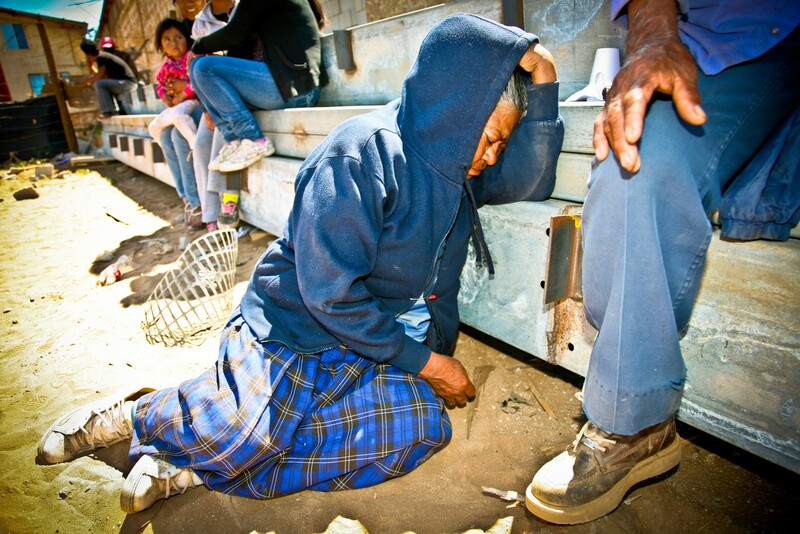 Reports of such abuse date as far back as the last strike in the San Quintín Valley in 1988. The majority of landowners and supervisors are men, while field workers and pickers are often young women—poor, indigenous migrants with little formal education. They are easy prey for supervisors asking for sexual favors in exchange for hiring another family member or offering a raise to the woman or the woman’s father, brother, or husband. Teresa Córdoba is a Triqui indigenous woman from the state of Oaxaca who has worked in the fields for the past 15 years. She stares at the floor as she remembers the last time a supervisor demanded sexual favors from her in order to keep her job. Her voice barely rises above a whisper as she describes what the man said he wanted to do to her. A single mother of three children, she believes that the supervisors put more pressure on women like her because they are desperate to keep their jobs. “Not even the owners’ sons are so cruel,” she says. Government authorities, including Mexico’s labor department, dismiss the severity of the problem. Meanwhile, Fernando Rodriguez, the current president of Los Pinos, maintains that he has not heard of a single case of sexual harassment or abuse in his company. “We asked how many charges have been filed and found only seven cases this year, none of them from Los Pinos,” Rodriguez insists, adding that he would take proper and immediate action if such a case did occur in his company. Even as the strikers faced serious obstacles while pursuing their goals, the labor action in San Quintín continued to gain momentum partly due to the efforts of female workers like Emilia and Teresa—both of whom have pushed relentlessly to improve living conditions in their community. During the 1988 strike, the mainly indigenous migrant workers who had settled in the valley formed a series of neighborhood committees that were led by women—largely because community work was widely regarded as an extension of housework. At first the committees asked government officials for schools and running water. But 25 years later, they are the driving force behind the strikes, and their female leaders are bringing attention to women’s right issues such as reproductive health and domestic violence. Emilia is a committee member who joined the strike. Her husband, whom she married at the age of 14, works as a security guard. He stayed home with their children while she rode a bus with other strikers to the state capital, Mexicali, where she was interviewed by a local television reporter about sexual harassment in the fields. When she returned to San Quintín, she learned that she no longer had a job. “The supervisor told me they no longer had any openings. But my friends who still work there were asked ‘Did you see your friend on television? She is no longer working here because she wants to be a television star,’” Emilia remembers. 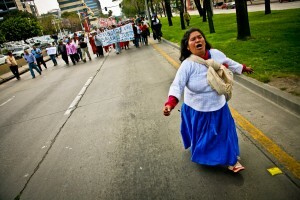 As the traditional roles played by indigenous women continue to evolve and expand, prominent female campaigners for social change have emerged, including Lucila Hernandez, a women’s rights activist and founder of Casa de la Mujer Indígena en San Quintín (House for Indigenous Women in San Quintín). “What good is it to have medical coverage for workers if there is a lack of specialists in the region, if pregnant women are dying in my arms during labor while we are taking them to Ensenada, three hours away?” she asked. Margarita Cruz, the current director of the House, provided information to news media and human rights organizations about the forced entry by state police into strikers’ homes back in May. A few days after that incident, both Hernandez and Cruz toured San Quintín with six members of the National Commission for Human Rights to document claims of police brutality against workers and their families during the strike period. Sánchez is part of a group of leaders who in recent years have participated in or led strikes in Florida, California, and Oregon while employed there as temporary field workers. Having seen firsthand the gains won by organized labor in the United States, they have returned to San Quintín and applied their experiences to the current strike movement. They have also developed a network of resources and contacts with social justice organizations north of the border, harnessing these groups’ political, economic, and moral support. The United Farmworkers of America, founded by Cesar Chavez, and the Binational Organizations Indigenous Front, which works to secure the rights of indigenous Mexicans living in both the United States and Mexico, have publicly supported the striking workers. Activists in the United States have engaged in campaigns to educate the public about the working conditions of people in Mexico who grow their produce. Some consumers have asked their local stores not to carry Driscoll’s produce, and calls for boycotts have emerged on social media, along with hashtags like #Bloodberries and #Slaveberries. The international attention and support given to the strike undoubtedly contributed to its successful outcome and will likely play a role in helping to ensure that the terms of the June agreement are ultimately put into effect. “[The produce companies] might say we are just dirty Indians, but thanks to us ‘dirty Indians’ they have power and wealth, they buy new cars, they enjoy good food, and we don’t. Thanks to us they have all of that, and we need them to acknowledge it,” Emilia says, with a newfound sense of pride.